In the summer of 1944 Pauling, looking forward to the end of the War, contacted Frank Blair Hanson (the Rockefeller Foundation representative who had cut Pauling's funding for artificial antibodies), promoting a broad-scale postwar attack on the structure of proteins: "Although proteins are so complex that we can not hope that a final and complete solution of the problem of their structure will ever be obtained, we can, I think, look forward to getting in our lifetime a reasonably good insight into the general principles of protein structure," he wrote. General principles were what Pauling was after. He, like many – perhaps most – protein researchers, despaired of ever nailing down the precise atomic structure of any real-world protein. The giant molecules were simply too complex, too hard to work with, too enormous to allow precise analysis. There were increasing numbers of good x-ray photographs of protein crystals and fibers, especially from Britain, and more were to come in the next few years, but the analysis of these images required computing power far beyond anything available at the time. Analyzing x-ray patterns, in Pauling's view, was not the final answer. He was also aware of the limits of his laboratory. His protein research group was still relatively small and ill-equipped compared with places like the Rockefeller Institute, or Harvard, or Svedberg's operation in Sweden, or the group of protein experts being gathered by Sir Lawrence Bragg at Cambridge. Pauling had made enormous strides despite this disadvantage, using a limited amount of x-ray crystallography, a lot of immunology, and especially his own intellect as his tools (and doing almost nothing with a dozen other important techniques like ultracentrifugation). Now he was ready for more. He had a grand vision of building the Caltech protein group into a force to be reckoned with internationally, capable of mounting a coordinated attack on both structure and function, working toward an explanation of human physiology at the molecular level. He wanted to give jobs to the most talented of the many young researchers who had been working on propellants and other wartime projects. He wanted to hire virologists and physiologists, bacteriologists, enzymologists, and pharmacologists. He wanted to gear up with the latest equipment. The Rockefeller Foundation wanted Pauling to wait until the War was officially over. See Also: Letter from Linus Pauling to Frank Blair Hanson. June 27, 1944. See Also: Letter from Linus Pauling to Warren Weaver. October 5, 1944. See Also: Letter from Frank Blair Hanson to Linus Pauling. November 24, 1944. See Also: "A Note on the Serological Activity of Denatured Antibodies." 1944. 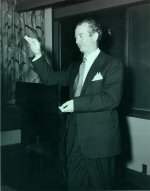 Linus Pauling in lecture. 1940s. 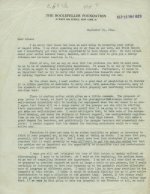 Letter from Warren Weaver to Linus Pauling. September 21, 1944.